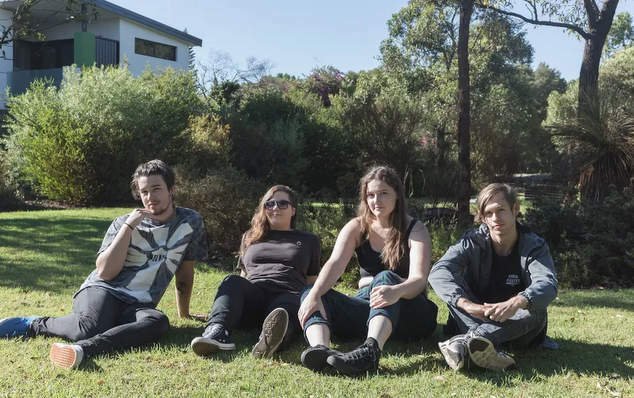 Local punk band Hell Average took their winnings from a recent ‘Battle of the Bands’ competition and used it to record a new single Cold Day in Hell. The foursome will be launching the tune with a gig at The Boston on Saturday 2nd June. Vocalist Izzy Moroney and guitarist Aidan Dever formed the group in mid 2017 after leaving their own separate projects. They describe their band as an opportunity to combine their love of pop punk. Amy Muir joined them on bass while Joe Mulqueen took a seat at the drum stool. New track Cold Day in Hell opens with a great guitar riff and a crash of drums before Izzy Moroney launches into some memorable lyrics about friends you just can’t have time for anymore. “I can’t take you anymore, you take and take, you waste up space.” Moroney sings. Last year the band released their debut single Straight Outta Centrelink and supported Ghouls UK when they played in Perth. The new tune will be available online from 1st June, find all the details of the launch show on Facebook.